Well, January is nearing a close and I’ve just had my first article of 2017 featured in a magazine called University Business. This article tells the story of why we should use Office 365 in education. 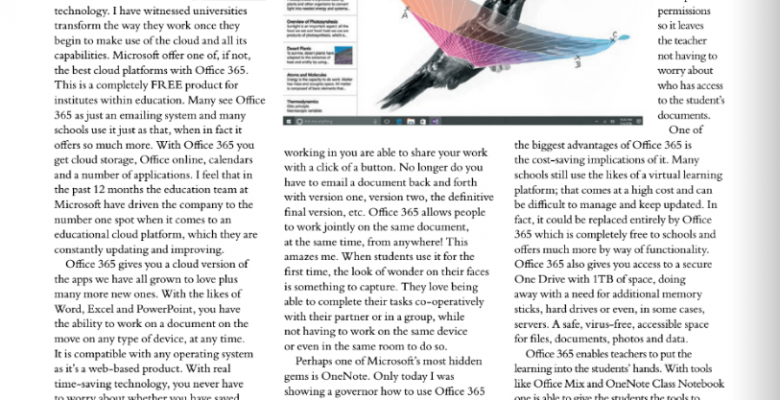 This is my 3rd article to be featured by Wildfire publications and this one was my most enjoyable to write as Office 365 plays a major part in my working day and is something that I feel really helps in education. To read the article please visit University Business. This entry was posted in Blog, Computing, EasiPC, Education, Microsoft, Office 365 and tagged easipc, education, feature, microsoft, office 365, office365. Bookmark the permalink.